Entertain with simple style. 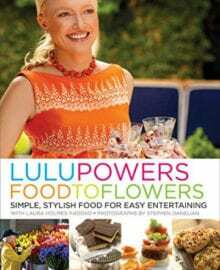 Lulu Powers, Los Angeles caterer and event planner, has filled this book with over 100 fun, fresh recipes and ideas that will make all your entertaining chic and sophisticated. Delight your guests with an afternoon winter picnic, make everyone’s morning bright and cheery with a coffee and newspaper brunch, or have a rollicking evening with retro game night. Any time of day, a cookie party brings a guaranteed smile with plates stacked tall with chocolate-ginger crinkles and crispy walnut stars. We know, you’re smiling already.